We Georgians love hummingbirds. Each year folks from Woodbine to West Point and Bainbridge to Blue Ridge spend hours enjoying the beauty and aerial acrobatics of the birds John James Audubon called "glittering fragments of the rainbow." Yet, although these tiny dynamos are immensely popular, many of us are not doing all we can to enhance the habitat the birds need. Realizing this, a few years ago the Garden Club of Georgia and DNR’s Nongame Conservation Section launched the Hummingbird Haven Program. 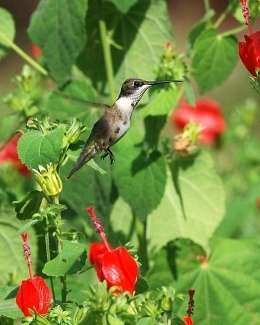 Read the rest of Terry’s column to learn more about the Hummingbird Haven initiative and how it both can help hummers and increase sightings in your yard. Henslow’s sparrows never soar. They flit, dart, flicker. And even then reluctantly. “They don’t like flying. They like running,” says DNR wildlife biologist Todd Schneider, who should know. He spent part of the past five winters tromping through boggy flatwoods in south Georgia, dragging a long rope to flush and hopefully catch the elusive songbirds he likens to mice with wings. Schneider and volunteers were at it again late last month at Paulks Pasture Wildlife Management Area, west of Brunswick. Property owner Plum Creek, a DNR Forestry for Wildlife partner, has managed part of a powerline corridor and nearby woodlands for Henslow’s, regularly burning the areas to help create the mix of grassy cover and open pine forests the sparrows need for shelter and food in winter. Henslow’s seem to appreciate it: Paulks Pasture is Schneider’s top survey site, which is saying a lot for this species. Habitat loss has sent Henslow’s numbers spiraling in recent decades. The birds, which breed in the Midwest and Northeast and winter in the Southeast’s Coastal Plain, are state-listed as rare in Georgia and considered a species of conservation concern range-wide. Yet their secretive nature and small numbers make them hard to survey. The main approach: Drag a thick, weighted rope through likely habitat. Pinpoint where flushed birds that appear to be Henslow’s land. Set up a mist net. Try to scare them into it. All of which is more effective than it may sound. Schneider banded 29 this winter at his “standard” sites – Paulks Pasture, Moody Forest and Townsend WMAs. He also found two new promising areas. Admittedly, though, the number of banded Henslow’s fell far shy of last year’s 86, a survey high. The unexplained drop is another data point underscoring the need for continued research. Video: Todd Schneider talks Henslow’s habitat. 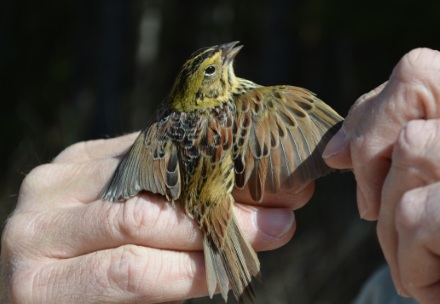 29 Henslow’s sparrows banded at long-term survey sites, less than 40 percent of the four-year annual average of 73. Seven recaptured a year or more after they were originally banded. One of the Henslow’s recaptured at Paulks Pasture weighed 13.8 grams (less than a half-ounce) both times it was caught, though two years apart. 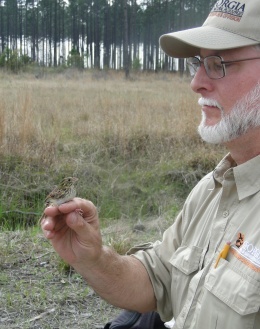 Henslow’s sparrow research is made possible in part by Georgians who gave to the Georgia Wildlife Conservation Fund through their state income tax returns. All contributions on line 26 of Form 500 or line 10 of Form 500EZ benefit native animals and plants listed as species of conservation concern -- species varying from Henslow’s sparrows to bald eagles. DNR's nongame wildlife license plates also benefit those plants, animals and the habitats they need. 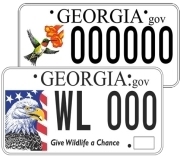 The eagle and hummingbird tags accounted for 41 percent of revenue to the Georgia Wildlife Conservation Fund last year. The fund supports the Nongame Conservation Section, which leads DNR nongame efforts. DNR Wildlife Resources Division leaders spread the word about nongame conservation and key funding in the Teaming With Wildlife Fly-in Feb. 24-25 in Washington. The annual event is an opportunity to inform members of Congress about how federal programs such as the State and Tribal Wildlife Grants Program are preventing wildlife from potentially becoming too rare or costly to restore. State and Tribal Wildlife Grants is the only federal program designed to prevent wildlife from becoming endangered through voluntary, proactive conservation. The Wildlife Resources Division uses the funds to research and monitor species of greatest conservation need, restore habitat, acquire land and accomplish other work identified in Georgia's State Wildlife Action Plan. Also called SWAP, the plan is a comprehensive wildlife conservation strategy created in 2005 with partner agencies, organizations, stakeholders and the public, and required to receive State Wildlife Grants. The SWAP is being revised to reflect the most recent conservation data and needs. Georgia’s Fly-in contingent included Wildlife Resources Division Director Dan Forster, Assistant Director Mark Whitney, Nongame Conservation Section Chief Jon Ambrose, Georgia Wildlife Federation President and CEO Todd Holbrook, and Thomas Farmer, director of government relations for the Georgia Chapter of The Nature Conservancy. Teaming With Wildlife Coalition is a national, 6,400-plus member coalition of agencies, organizations and businesses that support dedicated funding for state nongame wildlife conservation programs. Conserving Georgia’s nongame wildlife is slated for $300,000 in the state budget passed by lawmakers and scheduled to taking effect July 1, if Gov. Nathan Deal approves as expected. The state appropriation, the first for nongame in more than a decade, represents about 3 percent of the annual budget for DNR’s Nongame Conservation Section, an agency that depends on fundraising to conserve the 95-plus percent of Georgia wildlife species not hunted or fished for, plus rare plants and natural habitats. Another bill introduced in the just-ended General Assembly would create a Georgia Legacy Trust Fund dedicated to protecting and preserving conservation lands and powered by 75 percent of the tax revenue from sales of outdoor recreation equipment. House Bill 693 targets a long-held goal of conservation groups and will be taken up during the 2016 session. Four young bird artists were announced last week as T-shirt Art Contest winners in Georgia’s 10th annual Youth Birding Competition. 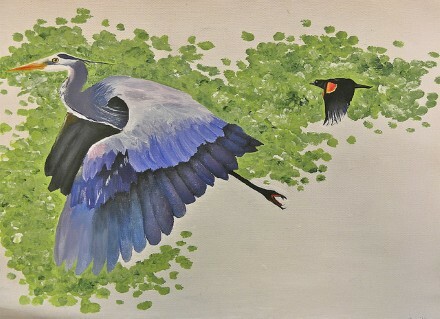 Grand prize goes to Carrollton High School 11th-grader Ivey Smith for her great blue heron painting (above). Urban teens with a bent for birding and conservation can earn full scholarships to attend a Birds, Careers and Conservation Workshop at the Cornell Lab of Ornithology in New York June 29-30. Deadline to apply or nominate a teen is April 15. 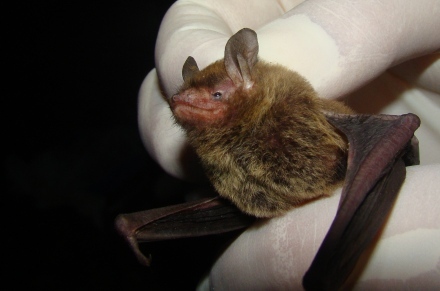 Northern long-eared bats, one of 16 bat species found in Georgia, will be federally protected as threatened, primarily because of the threat posed by white-nose syndrome. Comments will be accepted through July 1 on an interim rule aimed at accommodating some activities, such as forestry, in the bat's habitat. A short-finned pilot whale and a manatee recently stranded dead on Georgia beaches – the whale (above) on Little St. Simons Island and the manatee on Jekyll Island, the Georgia Marine Mammal Stranding Network reports. The short-finned whale, checked by DNR and Little St. Simons Island staff, was the first of that species to strand in Georgia since 2000; samples submitted for analysis could show why. Alerted by a boater, DNR biologists also found and freed a bottlenose dolphin that had its peduncle wrapped in a crab pot buoy line near Brunswick. The dolphin appeared OK and quickly swam away. Report marine mammals stranded or in distress by calling (800) 2-SAVE-ME (1-800-272-8363). 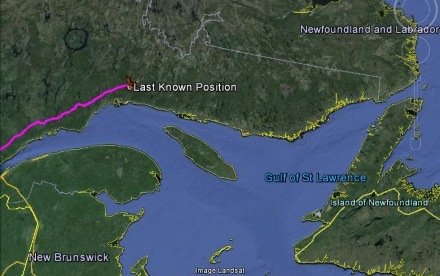 In the raptor version of Where’s Waldo, the golden eagle tracked from middle Georgia has migrated to near the Gulf of Saint Lawrence (“Rare eagle tracked,” Feb. 25). Some other golden eagles monitored on migrations in eastern North America have spent the summer even farther north and west in Canada. Names in the news: Nongame Conservation Section biologists Dr. Jessica McGuire and John Jensen explore forest management that helps gopher tortoises in the March-April issue of Georgia Forestry Today. (Also see this brochure on forestry practices to enhance tortoise habitat.) Georgian Teri Nye is the artist for the 2015 Pollinator Partnership poster, which focuses on carnivorous plants and their pollinators. Bird banding times, dates: Panola Mountain State Park, Stockbridge – April 24, 6 a.m.; May 9, 5:50 a.m.; May 23, 5:30 a.m. Joe Kurz WMA, Woodbury – May 10, 5:50 a.m.; May 24, 5:30 a.m.; May 30, 5:30 a.m. Updates, including schedule changes: Charlie Muise, Georgia Important Bird Areas Program. Tagging project tracked endangered right whales this winter. Rare salamanders found at Mayhaw WMA. Call it Flatwoods Sallies Part II: 20 frosted flatwoods salamander larvae were dip-netted from a Fort Stewart pond Tuesday, with four taken to Atlanta Botanical Garden for a captive-breeding project to help sustain the federally threatened species. 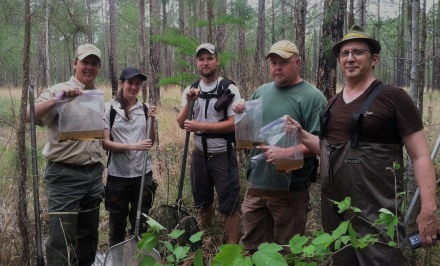 DNR, Fort Stewart, Atlanta Botanical Garden and Florida Fish and Wildlife Conservation Commission staff caught the larvae at the pond, the only site at the base to produce frosted flatwoods salamanders in some 15 years. Fort Stewart is one of only two places in Georgia where these sallies have been found in more than a decade. This week’s find follows the recent re-discovery of endangered reticulated flatwoods salamanders in southwest Georgia ("Rare sallies at Mayhaw," March 31).